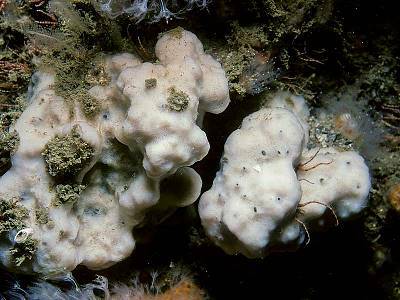 Description: This off-white coloured sponge may grow as a thin sheet, but typically has a massive-lumpy form (in patches up to 1m across). It is firmly attached to the substratum by a broad encrusting base. Overall it looks like cold mashed potato. 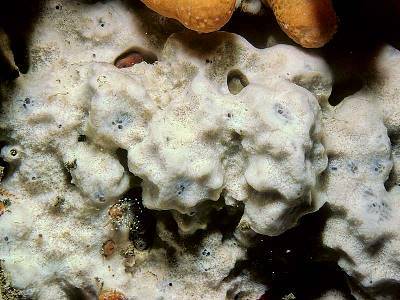 Habitat: This sponge is usually found on vertical rock faces or under overhangs in rock in areas exposed to moderately strong wave action and tidal streams. It has most frequently been recorded on limestone at depths between 15 and 30m. Distribution: This species is recently known from a number of islands off southwest Britain and western Ireland. 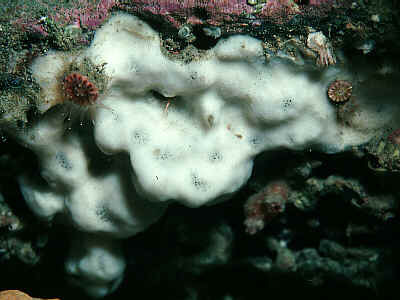 Similar Species: The irregular surface and white colour in a massive sponge are quite distinctive. A massive, white, lumpy sponge. Picton, B.E. & Morrow, C.C. (2016). Thymosia guernei Topsent, 1895. [In] Encyclopedia of Marine Life of Britain and Ireland.